So summer is practically over, and it's the first day of public school for children all around Hampton Roads. The fun doesn't stop though! Because we're having a Pinterest party… and not just one, but quite a few over the coming months! To kickstart this internet shindig series, we have lead local makeup artists and hostesses Dhalia Edwards and Kim Porter to show the way. How does it work? From September 1st to the 15th, everyday, you'll get a dose of gorgeous wedding makeup ideas curated from the experts themselves right on Pinterest! No matter what your wedding style may be, you'll see different bridal and bridesmaid looks for any face, for any season, for any type. 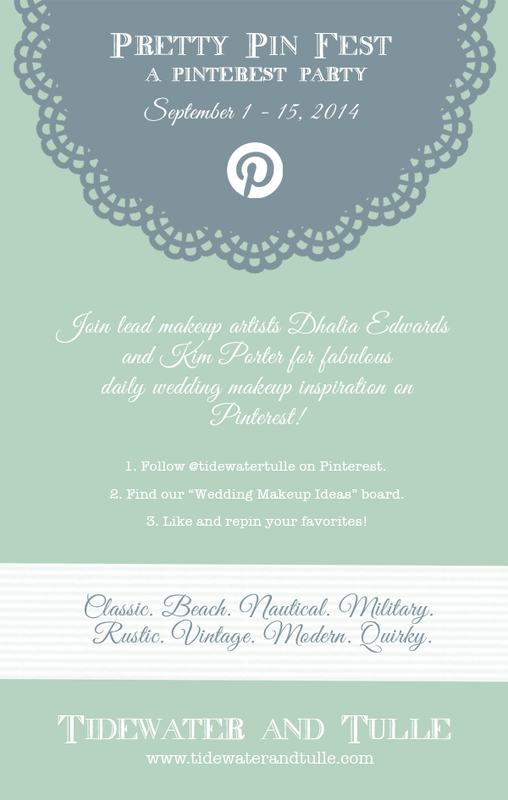 Dhalia and Kim know faces, so I'm personally excited to see what gets shared! HEAD OVER TO THE PRETTY PIN FEST ON PINTEREST!